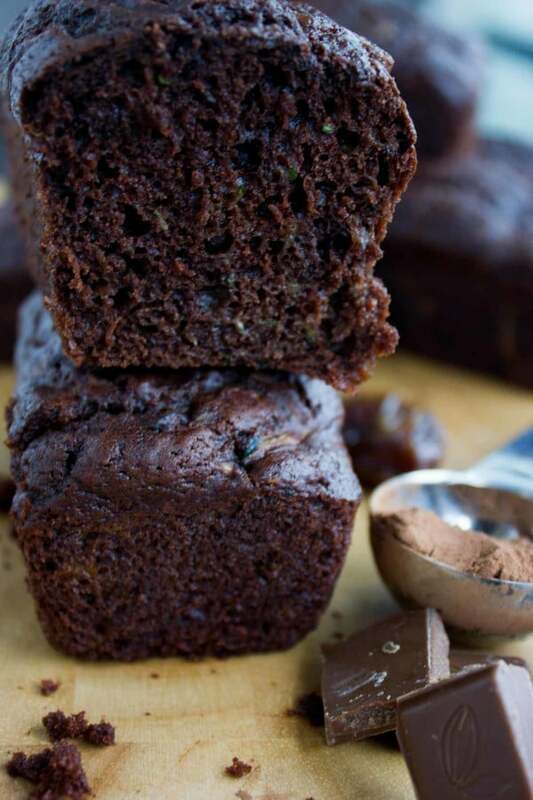 This Double Chocolate Zucchini Bread is moist, fluffy and chocolatey and has all the qualities of an amazing loaf cake! 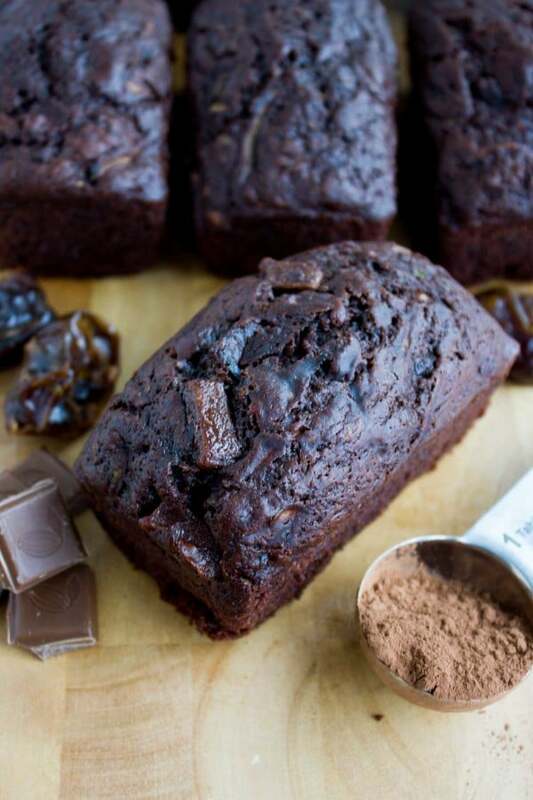 No one will guess that the secret ingredient for this decadent moist chocolate loaf cake is shredded zucchini! Imagine a Zucchini Bread with a bit of everything. It’s a sweet bread, but it’s also a really nice cake. It’s not just a cake, it’s a really fluffy chocolate cake with tons of chocolate flavor from the cocoa powder and chocolate chips. Oh, and there’s also dates! 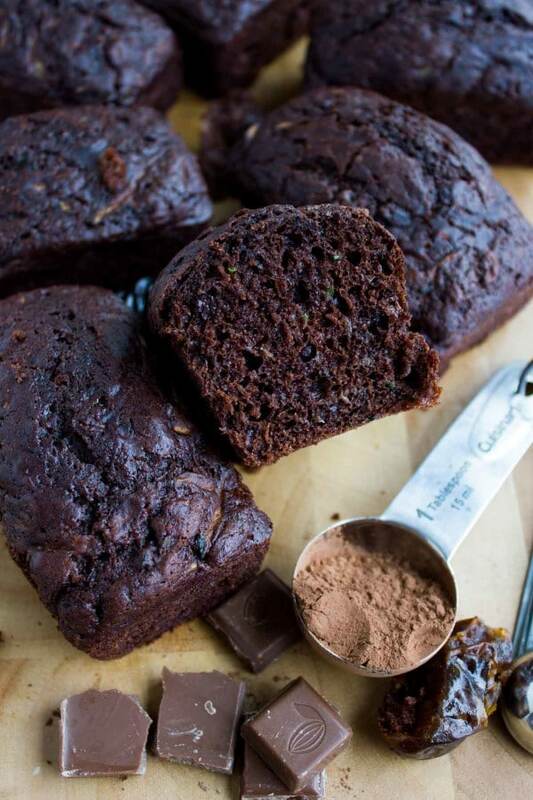 This Zucchini Bread Recipe is a light, fluffy, super moist and intensely chocolate-y loaf studded with chocolate chips and tiny pieces of dates! So obviously, there’s no way anyone will notice the shredded zucchini added in this Zucchini Bread recipe! 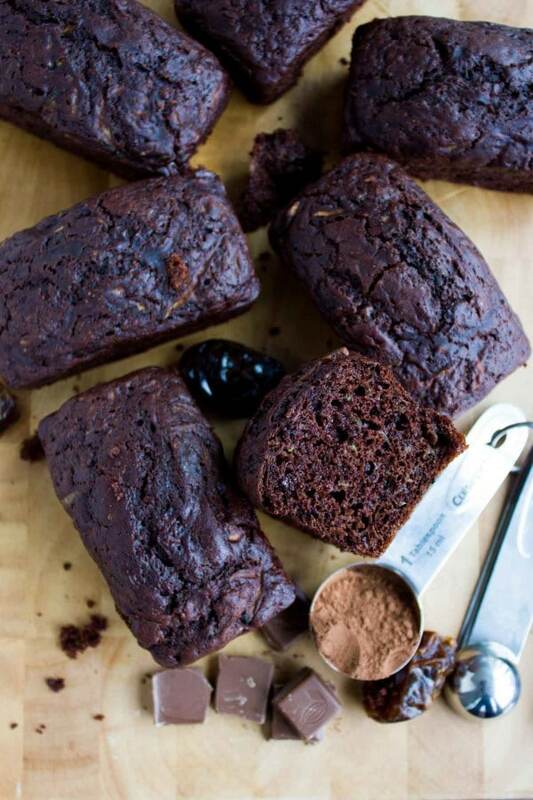 We sneak it in to boost the moisture level of this chocolatey loaf cake and to lighten it up, making this a healthier cake! A must try recipe for chocoholics who want to eat better. 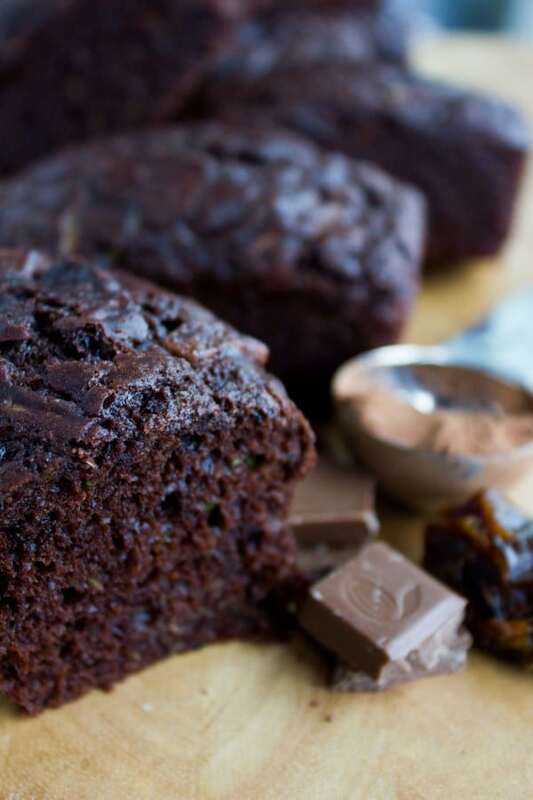 A word about the dates: They add some more moisture to this Double Chocolate Zucchini Bread. And of course, they also add sweetness. A nice faint sweetness that perfectly balances the chocolate without any date flavor to take mess with your chocolate moment. To make this moist and fluffy Zucchini Bread, you’ll need a whisk and 2 bowls. One bowl for dry ingredients and one bowl for wet ingredients. A word about pan sizes: I bake my Zucchini Bread in this mini loaf pans and they only need 20 mins. However, you can bake them in a loaf pan for an hour, or in a square pan and cut them into squares. To make the batter for this Zucchini Bread recipe, preheat the oven to 375 degrees F. Spray a mini loaf pan with baking spray and set aside. In a small bowl, whisk the dry ingredients: flour, baking powder, baking soda and salt. In another bowl, whisk together the wet ingredients, namely the egg, sugar, yogurt, oil, vanilla and cocoa powder, until smooth. Using a rubber spatula, fold the dry ingredients into the wet ingredients without overmixing the Zucchini Bread batter. Just make sure there are no visible white specs of dry ingredients. Some lumps in the batter are ok.
With the same spatula, fold in the chocolate chips and chopped dates. Then pour the Zucchini Bread batter into a mini loaf pan and bake the loaf for 20-24 mins. If baking this Zucchini Bread in a loaf pan, line the pan with parchment paper and bake for an hour. Should you decide to bake this Zucchini Bread i8-inch inch square pan, line the bottom with parchment paper and bake the cake for 45 mins. Feel free to go nuts here and add some chopped almonds, pistachios or walnuts to your zucchini bread batter for extra crunch. Make sure your zucchini is well drained before adding it to the batter. The sweetness of the zucchini bread can be heavy if you’re using certain types of dates (with higher sugar content) so feel free to lower the sugar by 1/4 cup. Chocolate Banana Chocolate Chip Cake –this is the banana version of this zucchini bread, moist, intensely chocolate-y with a banana flavor that’s unbeatable! Whole Wheat Banana Bread Make this whole ehat or regular, it’s the BEST banana bread out there! Cheddar Zucchini Cornbread Recipe a savory one but seriously just as divine! Ultimate Blueberry Raisin Bran Muffins A delicious blueberry twist on the classic bran muffin! Preheat the oven to 375 degrees F. Spray a mini loaf pan with baking spray and set aside. In a small bowl whisk in the dry ingredients: flour, baking powder, baking soda and salt. In another bowl, whisk in the wet ingredients well: the egg, sugar, yogurt, oil, vanilla and cocoa powder until smooth. Using a rubber spatula, fold the dry ingredients into the wet ingredients without over mixing the batter. Just make sure there are no visible white specs of dry ingredients. Some lumps in the batter are ok. Using the same spatula, fold in the chocolate chips and dates. Then pour the batter into a mini loaf pan and bake for 20-24 mins. If baking in a loaf pan, line the pan with parchment paper and bake for an hour. If baking in an 8-inch square pan, line the bottom with parchment paper and bake the cake for 45 mins. The sweetness of the zucchini bread can be heavy if you're using certain types of dates (with higher sugar content) so feel free to lower the sugar by 1/4 cup. 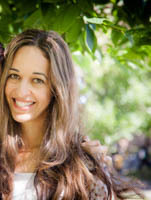 These pics make me want to run out and try your recipe! (Using gf flour, of course.) 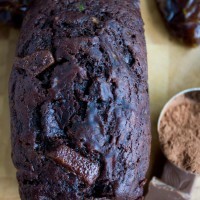 Love the idea of combining chocolate with dates and zucchini! Fantastic idea! 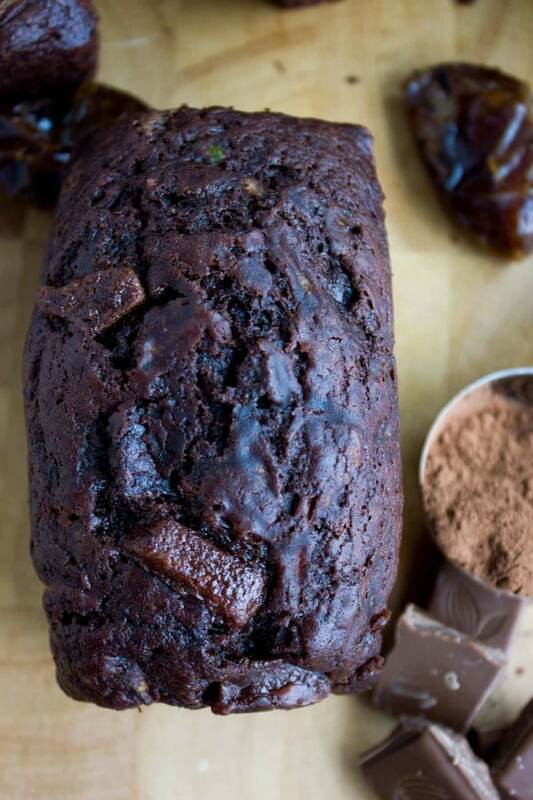 I love zucchini, but I never would’ve thought of dates and chocolate. What a great combo! This is so much my guilty pleasure 😉 Looks really soft and delicious. The recipe looks fantastic but I am confused about the amount of batter it will make. The recipe itself says “12 mini-loaf pans” but directions are given for only one mini-loaf pan. I will be using a regular 9 x 5 loaf pan and would like to know if one recipe makes sufficient batter for that?